R & S Furnishings manufactures and supplies sofa bed mattresses to commercial customers throughout Derby, Nottingham and Leicester, the surrounding areas of the East Midlands and the rest of the United Kingdom. With over 25 years’ experience in the sofa bed mattress manufacturing trade, we have a wealth of experience and industry knowledge in the supply of sofa bed mattresses to commercial companies and well-known furniture retailers. With a highly skilled team, we can design, manufacture, pack and deliver both large and small mattress orders efficiently, supplying larger and smaller clients with a reliable, cost effective service. 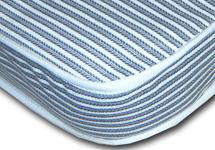 The budget range comes in three colour choices of stitch bond fabric, black, blue or grey stripe. 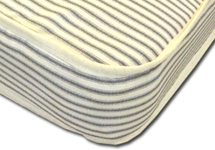 The Standard sofa bed mattress comes in a choice of fabrics, as well as a range of black and white stripes. 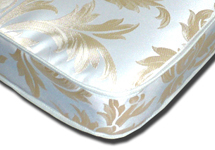 The higher quality sofa bed mattress is covered in damask fabric, and is silver and gold in colour. This pocket sprung sofa bed mattress is the highest quality mattress produced and is used for top-of-the-range sofa beds. It is the most comfortable of our entire range and is covered in damask fabric. Our unrivalled experience in the manufacturing and selling of sofa bed mattresses, together with our in-house design and manufacturing capabilities enables us to offer a range of sofa bed mattresses, produced to the highest of standards with quality and comfort in mind. At R & S Furnishings, all of our sofa bed mattresses are manufactured with two or three fold actions, with an additional bespoke mattress service for customers within a 20-mile radius of our Ilkeston site. Call now for more information: R & S Furnishings today on: 01159 325 361. 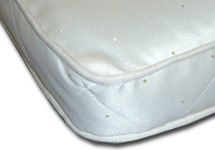 Memory Foam R & S Furnishings stock memory foam for all sizes of mattresses.